There has been a lot of talk about fascism since the electoral college victory of Donald Trump. More specifically there has been talk of Fascism, the so-called “alt-right”, a new authoritarian nationalism, and the specter of Putin's Russia. This electoral college victory, unexpected even by Trump, has caused a massive re-configuration of the political landscape. The Authoritarian center-right represented by the Democratic party's dominant clique has made the strategic decision to base it's future electoral appeal on a multicultural anti-Russian nationalism as opposed to a white nationalist Islamophobic nationalism. This represents a wholesale shift to the right by the elites and leaves two nationalist options on the table, one proto-fascist, one multicultural centrist, both authoritarian and pro-business. It is clear from Trump's recent cabinet selections that the Wall Street firm Goldman Sachs would have a place either administration just as it has in the last three. 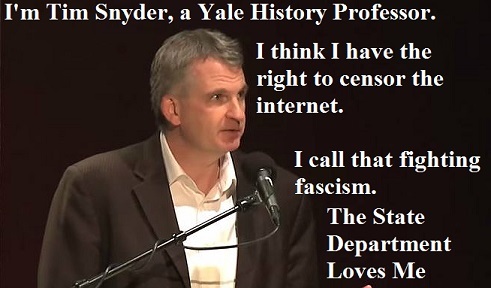 The worst offender amongst public intellectuals is Yale professor Tim Snyder. Snyder is one of the most often cited authors in USAID publications since he began his doctoral work at Oxford. One could call him the intellectual darling of the State Department's Eastern European desk. He became more publicly active during the 2014 Ukraine crisis which he used to push his warmed over cold-war “Stalin was as bad as Hitler” line of liberalism. No sane person would argue for the humanitarian nature of Stalinism, but Snyder's reading and writing history omits many actors from the Eastern European stage of history that resisted both authoritarian nationalism and authoritarian communism from a perspective that was not centrist, authoritarian and beholden to business elites. While many of the news sources flagged by the browser extension or listed on propornot's site are annoyingly right wing (looking at you Alex Jones), some are on the progressive left, including Truthout.org, OpEdNews.org, and Counterpunch.org. Counterpunch in particular has long been critical of Putin and it's current editor in chief (Jeffery St. Clair) as well as it's late editor in chief (Alexander Cockburn) have a stellar reputation for fact checking and journalistic integrity stretching back decades. Propornot flags links on the website of The Mockingbird and of my former employer the Columbus Free Press, as Russian propaganda. It also flags links at The Outsider News, which is run by friends of mine. All of these links are ones critical of the Democratic Party. In short, if you criticize the center in any way you must be a Russian spy. Prop or not's website registration are hidden, and it has only existed since August. The browser extension is only traceable to a mail order llc incorporation firm in Santa Fe. It's social media presence is under used and Snyder was the first person to mention it in print, two weeks before it got a widely criticized 2000 word write up in the Democratic Party mouthpiece Washington Post. The website seeks to crowd source help in identifying people and media outlets that are Russian Propaganda. In other words, fight fascism by anonymously reporting citizens and journalists to anonymous people for saying the wrong things in public. Thus with a little participation, censorware becomes snitchware and liberal anti-fascism becomes totalitarian centrism. Yale Professor Snyder does not know that “unfreedom” is not a word. Repression is the word he is looking for. More importantly “Do not Obey in advance”? Wrong. If you see a bad program coming, plan to disobey in advance. Build the secret rooms in your attic now to hide immigrants and dissidents later. Defend the media says Professor Snyder while attacking the alternative media. Hypocrisy much? Those of us who are not lawyers and judges still have trades and professions Tim. How about people not snitching on their neighbors, or testifying at show trials? How about carpenters using their skills to build the aforementioned secret rooms? How about pharmacists making making the morning after pill available cheap on the black market? How about bartenders listening to their patrons so they can warn people of coming progroms? Can I be angry about the neo-liberal colonization of the concept of “resistance” too? Please? Like that time the entire Democratic Party stood right next to the Republicans and sang God bless America and voted for the Patriot Act? Or the time under President Obama when they voted to renew it? Professor Snyder, some of us are too busy to not use the internet before bed. Read? Thanks for the bibliography of Central and Eastern European anti-communist writers from 50 years ago. I note the only Western European dissident on that list, George Orwell, did not get his non-fiction first person account of actually fighting fascists, Homage to Catalonia, on your list. How about Orwell's “Politics and the English Language?” Of course if you had read that you would not have written any of this. Might be a good idea. Might not. Most of the French Resistance was not professionals in Paris. It was farmers in Provence and people fleeing labor conscription in Gascony. They did not stand out. They hid out. Then they struck back. You studied the holocaust Professor Snyder, didn't you know that? Believe in Truth says the guy calling for media censorship. Again, Hypocrisy much? Investigate by installing censorware? Investigate by subscribing to print media? Alternative print media that actually does investigative journalism is advertising supported not subscription based. The cover price is free. Subscription based print media sources are owned by large corporations. You are not subsidizing investigative journalism this way, you are bringing it under the narrow control of a very small clique of well paid editors who are obedient to power. Almost. Do not resist with people you don't know, build communities of trust and resistance with people you do know. Make resistance party of identity. Make large swaths of the country a no go zone for totalitarianism. Turn the totalitarian into the outsider, make power something that is imposed not bargained with. We entered a culture of denunciation already. Professor Snyder jumped headlong into with his endorsement lists of news sources thou shall not read. Some of us have been dealing with nazi graffiti for decades. We do not make a big show of removing swastikas, we wait for them to be replaced so that we can see who puts them up. Anti-Fascist resistance means going on the offensive against fascists not cleaning up their mess. Berlin did not surrender, it fell. This is the age of gerrymandered political districts, transactional politics and “bi-partisan” consensus. The calls for national healing, and giving Trump a chance coming from Democratic politicians have cemented one party rule. Voting in state and local elections is meaningless with only two parties with little difference between them. Translation, give your money to large lobbying groups with executives earning six digit salaries. “good causes” in the original was a link to the Southern Poverty Law Center's donation page. It has been alleged that the interest on that organization's endowment is greater than it's yearly operating budget. They do not need your money. Local independent political projects in your own community that you have a democratic say in do need your money, time and energy. Those projects offer you participation in your own liberation as opposed to promising to do it for you in return for a tax deductible gift. 15. Establish a private life. Nastier rulers will use what they know about you to push you around. Scrub your computer of malware. Remember that email is skywriting. Consider using alternative forms of the Internet, or simply using it less. Have personal exchanges in person. For the same reason, resolve any legal trouble. Authoritarianism works as a blackmail state, looking for the hook on which to hang you. Try not to have too many hooks. The Obama administration's expansion of Bush's surveillance state means many of us were already covering our tracks on the internet. Many of us already scrub the spyware off our computer. The security state has backbone level access to the internet, as exemplified by the NSA's XKEYSCORE project. Malware vigilance stops teenagers. Get and use proven effective open source data tools. If you were really afraid of blackmail you would not have taken those naked selfies anyway. You took them because you are beautiful and wanted to show that to someone else. Don't let prudish Yale history academics body shame you. 16. Learn from others in other countries. Keep up your friendships abroad, or make new friends abroad. The present difficulties here are an element of a general trend. And no country is going to find a solution by itself. Make sure you and your family have passports. Wrong. Figure out how to sneak across a border without showing paperwork to anybody. Get fake passports. Help people make fake passports. Know your third country destination before you enter the second. Canada and Mexico are travel routes not destinations and wanted dissidents are already on no-fly lists. 17. Watch out for the paramilitaries. When the men with guns who have always claimed to be against the system start wearing uniforms and marching around with torches and pictures of a Leader, the end is nigh. When the pro-Leader paramilitary and the official police and military intermingle, the game is over. The connections between the white supremacist movement and the police are well documented. Police are killing people faster now than before Ferguson. Yet the current administration's answer is more surveillance and blue ribbon commissions. When you see paramilitaries, prepare to fight them, directly. The baseline assumption here is that only Cops and Troops are armed. This assumes that the rest of us are not. We have a right to be armed. I personally am armed and this has saved my life from the fascists when the police and the FBI would have happily let me die. One during the Clinton administration and once again during Bush. Again Professor Snyder harkens to a disarming and disempowering centrist nationalist state. 19. Be as courageous as you can. If none of us is prepared to die for freedom, then all of us will die in unfreedom. Dying for freedom? Thanks no. I may have to do that. I'd prefer to win my freedom and live. That means fighting to win. That means some fascists are going to have to die. People my grandparent's age did it in the military and in the Abraham Lincoln Brigade. We call those people “The greatest generation” PS: Unfreedom is still not a word. The incoming president is as patriotic as apple pie and cross burnings, both of which are as much a part of the American patrimony as the massacre at Wounded Knee. Mark Twain once said “Patriotism is usually the refuge of the scoundrel. He is the man who talks the loudest.” The ivory tower of Yale has left Professor Snyder little place of refuge but patriotism. Some of us seek a broader less nationalist vision. One of humanity and universal human values and rights. Those values are incompatible with a patriotism that may not openly score immigrants, but will tolerate and profit from collateral damage done by our secret air force in their countries of origin until he arrives on our shores. Taken together Snyder's twenty points lead us away from our own empowerment, resistance, creativity and participation and into a slightly less vulgar nationalism that offers no true alternative to the rebirth of white nationalism as a mainstream political force.